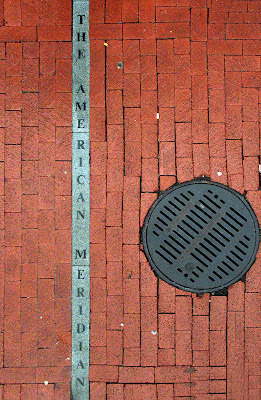 was the American Prime Meridian. 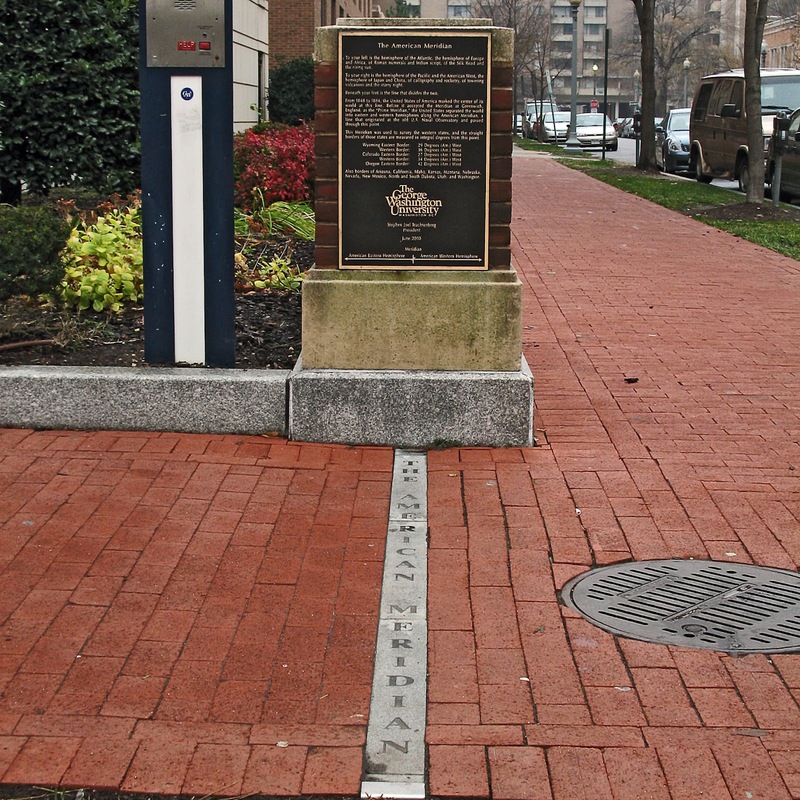 This marker at 24th and H Streets, on the campus of George Washington University, was erected in 2000 to commemorate the Washington Meridian. Before 1884, different countries measured longitude from different meridians. In Jules Verne's 20,000 Leagues Under The Sea, Professor Arronax, a Frenchman, asks Captain Nemo what meridian he uses to measure longitude, hoping the answer will reveal Nemo's nationality. Nemo says he'll use the French Meridian as a courtesy when talking to Arronax. The situation could be even more complicated. 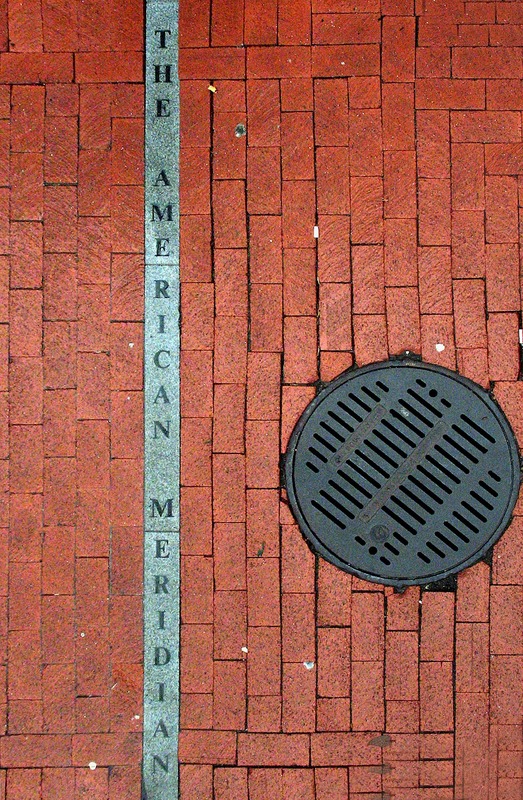 After 1848, the U.S. officially used the American Meridian, which ran along 24th Street, as its prime meridian for determining longitude on land, and the Greenwich Meridian for longitude at sea. 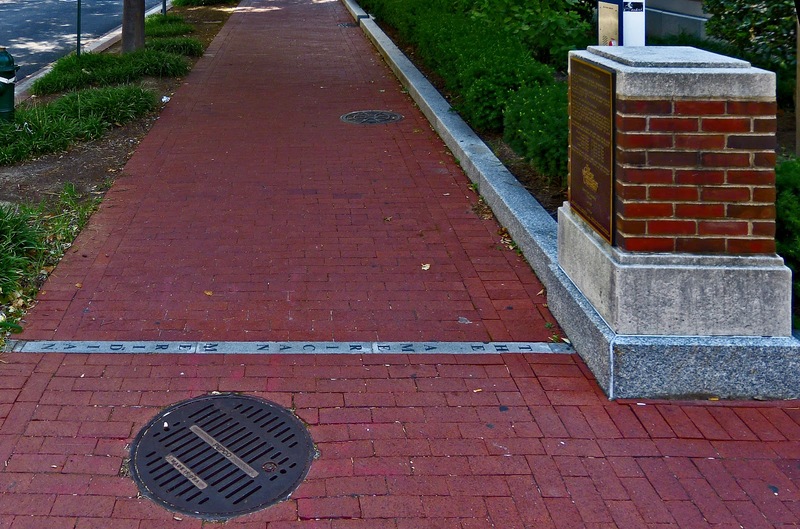 The plaque at 24th and H seems a little confused about the function of the prime meridian. To your left is the hemisphere of the Atlantic, the hemisphere of Europe and Africa, of Roman numerals and Indian script, of the Silk Road and the rising sun. To your right is the hemisphere of the Pacific and the American West, the hemisphere of Japan and China, of calligraphy and rocketry, of towering volcanoes and the starry night. Beneath your feet is the line that divides the two. From 1848 to 1884, the United States of America marked the center of its world at this line. Before it accepted the Meridian at Greenwich, England, as the “Prime Meridian,” the United States separated the world into eastern and western hemispheres along the American Meridian, a line that originated at the old U.S. Naval Observatory and passed through this point. 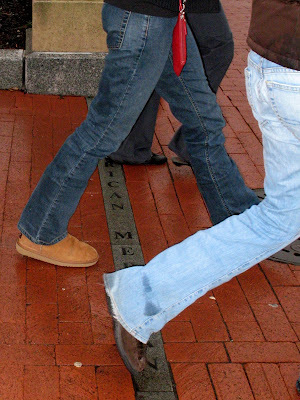 This Meridian was used to survey the western states, and the straight borders of those states are measured in integral degrees from this point. Also borders of Arizona, California, Idaho, Kansas, Montana, Nebraska, Nevada, New Mexico, North and South Dakota, Utah, and Washington. We don't really use the prime meridian to divide the world into hemispheres. No one thinks that Bristol is in the hemisphere of the Americas and Dover is in the hemisphere of Europe and Asia because they are on opposite sides the Greenwich Meridian which bisects Greater London. Similarly, it's a flight of poetic fancy to say that these GW students are stepping from "the hemisphere of the Atlantic, the hemisphere of Europe and Africa, of Roman numerals and Indian script, of the Silk Road and the rising sun" to "the hemisphere of the Pacific and the American West, the hemisphere of Japan and China, of calligraphy and rocketry, of towering volcanoes and the starry night" as they walk west down H Street. I suspect the poetry is attributable to Stephen Joel Trachtenberg. The real point of a prime meridian is to be longitude 0°, 0', 0". 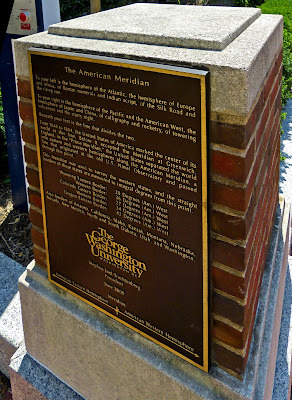 The American Meridian was longitude 0°, 0', 0" in the U.S. for land surveying purposes during an important period of western expansion. As the plaque notes, it was used to define the boundaries of several western states. 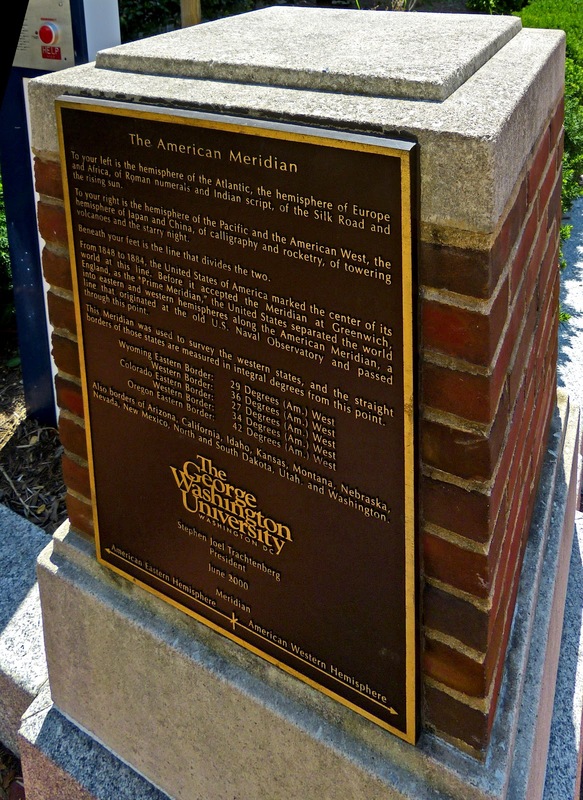 The Congress decreed on September 28, 1850, "that hereafter the meridian of the observatory at Washington shall be adopted and used as the American Meridian for all astronomic purposes and .... Greenwich for all nautical purposes." The Washington Meridian was taken to be the meridian that ran through the U.S. 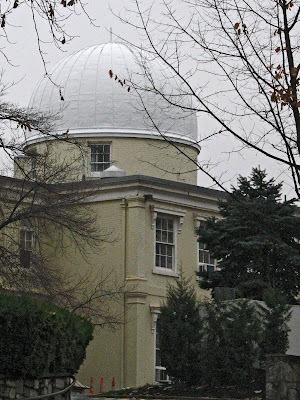 Naval Observatory. 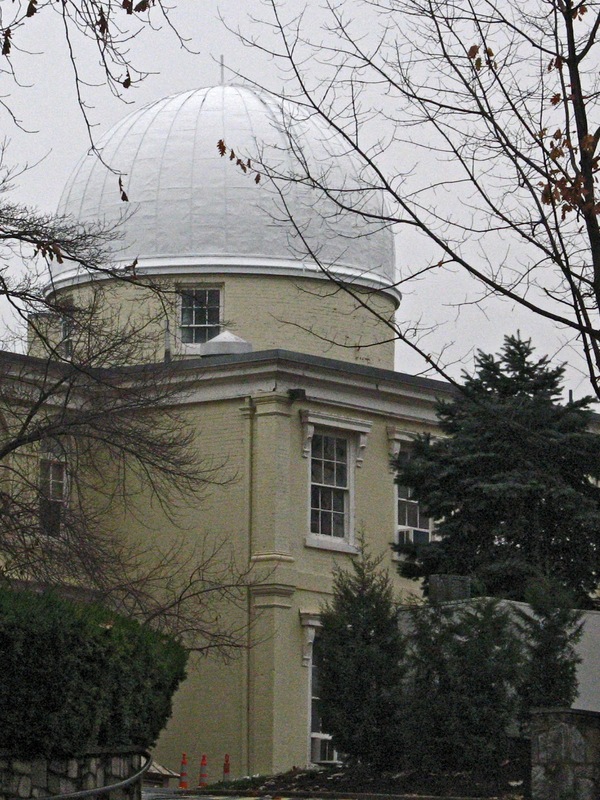 The observatory was moved to a better location on Massachusetts Avenue in 1893. 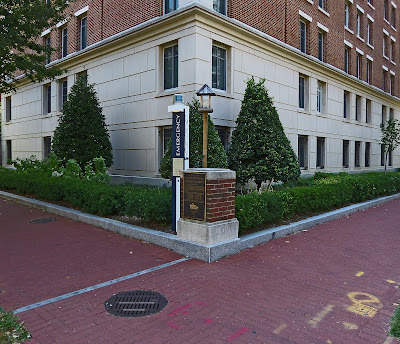 Until last June, the old observatory housed the Navy's Bureau of Medicine and Surgery. 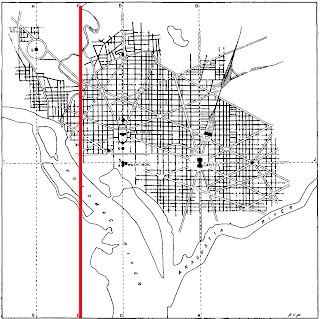 I've highlighted the Washington Meridian in red on Culley's map of the Washington Meridians. 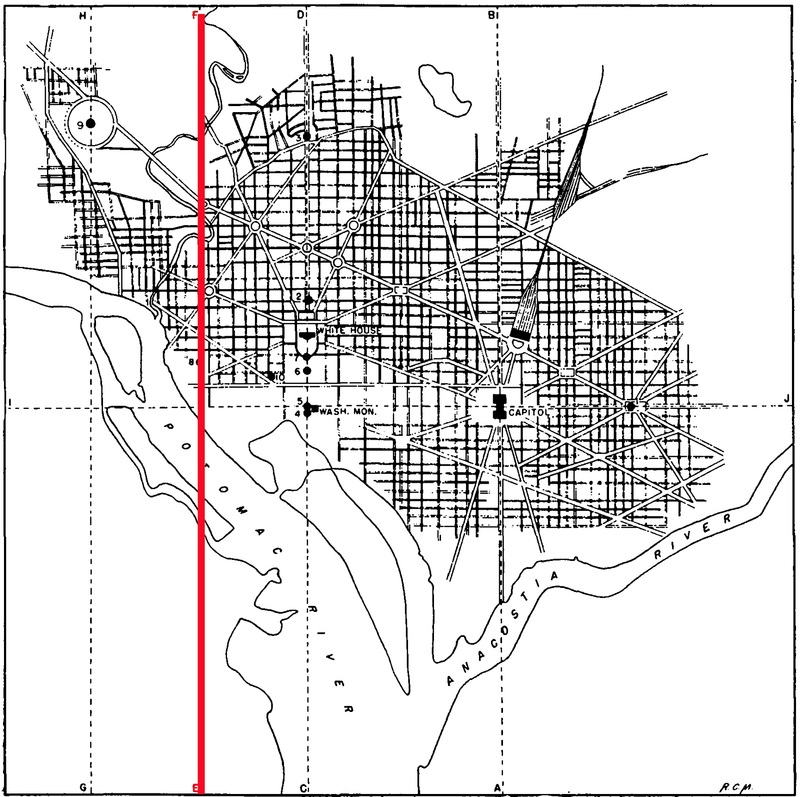 On this map, EF is the Washington Meridian, AB is the meridian of the Capitol which L'Enfant marked as 0°, 0' longitude on his map of the district. CD is the meridian of the White House, 16th Street and the Jefferson Pier. IJ is the latitude of the Capitol and the Jefferson Pier and Lincoln Park. Longitude is intimately related to time. Each of the infinite number of meridians has its own local time. Standardization involves agreeing to use the time of a particular meridian. 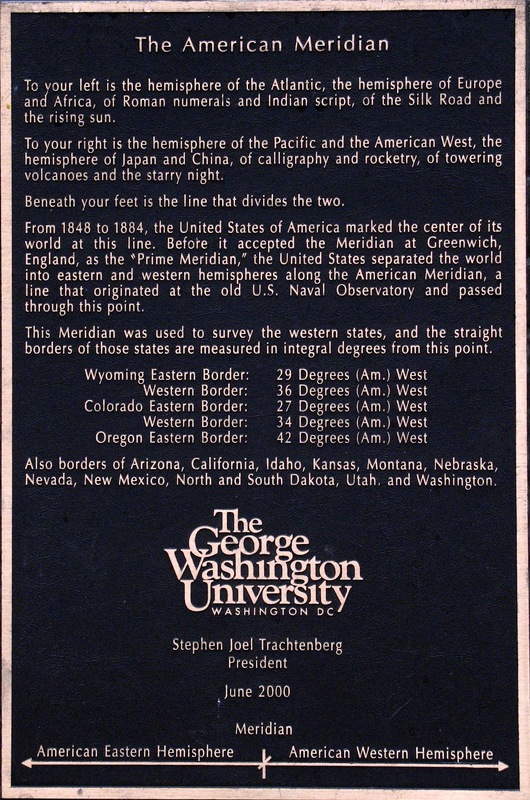 Dowd's first suggestion for a system of time zones used the Washington Meridian as the time meridian for the eastern time zone. Later versions of Dowd's system used the meridian of New York and even later the 75th meridian west of Greenwich which is now the time meridian for Eastern Standard Time. That would divide countries and even cities into different days so that a person walking west across the line would loose a day and regain it again when he walked back east. The selection of the Greenwich Meridian as the prime meridian placed this zone of anomaly in the middle of the Pacific. An international convention in Washington in 1884 established the meridian of the observatory at Greenwich as the basis for longitude and world time, making Greenwich Mean Time the world time standard. 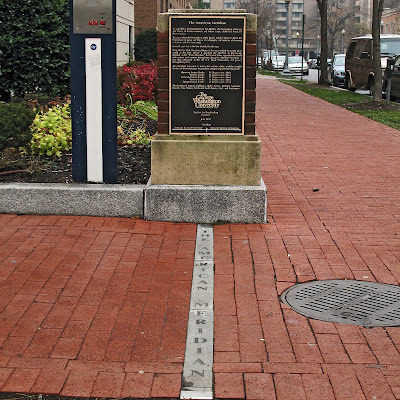 In 1912, the statute establishing the Washington Meridian was officially repealed, long after it had ceased to be used.